"Mr. Bond, you defy all my attempts to plan an amusing death for you." "Where all other Bonds end, this one begins..."
"Outer space now belongs to 007"
With those tag lines, MGM launched James Bond into a sci-fi extravaganza. Ostensibly created to cash in on the wave of sci-fi hysteria following the phenomenal success of Star Wars, the booklet that accompanies the DVD tells of the 30 million dollar budget for a film that eventually grossed 203 million dollars worldwide and set a standard not broken until Goldeneye 16 years later. 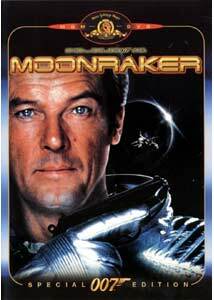 I have heard or read that Moonraker is one of the weakest of the movies in the James Bond series. However, after watching it on DVD, I have to disagree. There really is no movie quite like it as a "contemporary" space adventure, at least, until the meteor scare movies of recent years. All the elements of great Bond adventures are there. The villain is droll and eccentric, the women are beautiful and willing, the one liners are clunkers and inevitable, the climax is literally out-of-this-world. The special effects hold up very well and the idea of platoons of jet-suited astro-soldiers battling it out in orbit is really a hoot. The plot is certainly not one of the strongest in the series. It merely consists of Bond going from one stunning locale to another and finding an obscure clue that leads him to another stunning locale (somewhat similar to the plot of The Spy Who Loved Me, but let's not go there). The set pieces that take place are often worth overlooking a minor matter like plot. Roger Moore's more comic take on James Bond reaches full fruition in this movie and, although he gets off a few clunkers in his "Bondisms," his performance is very solid. After the astounding pre-credit freefall sequence, the film itself starts slowly in California with Bond's preliminary investigation where he meets Dr. Holly Goodhead and the evil Drax. However, Bond himself wastes no time in bedding his guide, using her to find vital clues in Drax's estate and killing an assassin while shooting at pheasant. When he is trapped in a centrifuge by Drax's henchman Chang, it is heart-pounding to say the least—the first of what are many truly spectacular special effects and action sequences in this movie. Things pick up speed when Bond goes to Venice and gets into a boat chase through the canals. His emergence on to Piazza San Marco is humorous, but a little campy. His knockdown, glass shattering battle with Chang is hilarious and exciting as tens of thousands of dollars of rare glass is destroyed, except, of course, for the vial of nerve gas that Bond found in the secret laboratory and had in his pocket during the fight. Bond, of course, takes the time to bed Dr. Goodhead and reveal her undercover status as a CIA agent before leaving her behind, of course, as he heads off to Brazil. Arriving in Rio De Janeiro, Bond beds another lovely and finds another clue. In the streets of Rio during Carnivale, he has the first of several encounters with the inimitable Jaws. In the Bond movies, Jaws is a tough character to absorb into the story. It is hard to dislike him exactly, but he seems to lend an extra cartoonish quality to an already stretched story and comic Bond. Jaws and Moore together threaten to take the Bond movies into the less than desirable area of pure camp. But enough of the seriousness is maintained, and the battle on the tram is outstanding stuntwork. The second water battle on speed boats as Bond closes in on Drax's headquarters is also very exciting and fun. The look on Jaws' face as he grabs the steering wheel of his boat and it breaks off in his hands as he heads over the falls is priceless. The special effects of the final sequence hold up very well. Especially in an era of digital animation that has jaded us to so many special effects of the past that were amazing in their day. The computers are not obviously badly conceived and, although there are cases where the devices have a certain mechanical quality that looks quite archaic compared to the more liquid, digital displays that we know today, the devices are not out of place with the style of the film. If someone had never seen a Bond movie (is that possible? ), I would heartily recommend this one to watch as entertainment, even over some of the actually better movies in the Bond series from the '60s. Many of its weaknesses as a part of the Bond series, are probably a good part of Moonraker's more mass appeal. There is very little in-depth study of James Bond the secret agent. In fact, there is very little time spent dwelling on any one detail or the other in the whole movie. Clocking in at the typical just over two hours of most James Bond movies, the pace almost never slackens. There are some cute touches to the filmmaking. The first 3 notes of Also Sprach Zarathrustra, the 2001: A Space Odyssey title theme, are blown by horns in the hunting sequence at the Drax estate. The five notes played in the contact with aliens in Close Encounters of the Third Kind are used as the password sequence to Drax's secret laboratory in Venice. Drax's space station owes much to the spaceship Discovery in 2001. It's very funny as Bond rides through the Pampas in Brazil in western gear much like Clint Eastwood's "Man with No Name" to the theme from The Magnificent Seven. There is a lot of product placement in the movie including Dr. Goodhead's pack of Marlboros in the drawer next to her airplane ticket to Brazil and 7Up signs all over Brazil. We just won't notice that all of these billboards are in English in Portuguese-speaking Brazil. Once we got into space, I almost expected Pan Am to be the maker of the Moonraker shuttle. Spotting these types of elements in movies is certainly one of the joys of DVD viewing, especially for the trivia fanatic. By this time in the series, the producers had refined the new style James Bond that has dominated the movies since. I often have thought that this was largely due to Roger Moore's lighthearted take on Bond, as opposed to Sean Connery's more brutal 007. The early Bond movies with Connery took much of their style from the spy thrillers of Alfred Hitchcock, for example Torn Curtain and Topaz. Beginning with The Spy Who Loved Me, the movie just prior to Moonraker, the combination of the blockbuster movie style of the '70's, the exhausting of the original novels by Ian Fleming (for all intents and purposes), Moore's self-assurance in the acceptance of the audience of his portrayal and the more modern style of director Lewis Gilbert refined the Bond franchise into what we know it as today with Pierce Brosnan. Light on plot, strong on action, beautiful this, exotic that, a dash of wit, shaken not stirred and we have some of the highest quality escapist movie fare available. Many stars of the Swarzenneger, Stallone and Willis ilk owe much of their success to the refinement of this formula like a great piece of computer software that is extensible, scalable and flexible. Image Transfer Review: Anamorphic widescreen transfer is certainly the only way to go, especially with older movies that have some wear and tear. The picture is crisp and dynamic. The colors are full and there is very little of the washed out quality that some films exhibit at this resolution. There are some grand pictures shown, for example, the freefall sequence at the beginning is very engaging visually, Bond's overflight of the Drax estate shows the miniature work of the special effects team to great advantage and the space flight sequences look very realistic despite the fact that there was no stock footage available for such a thing. Details are very crisp and this transfer also captures the "larger-than-life" quality that is essential to a Bond movie experience. Audio Transfer Review: The audio is a mixed bag. The case does not mention Dolby Digital 5.1, but in fact the soundtrack has been remastered for it. However, the balance between dialogue and sound effects seemed out of whack. There would be a scene of conversation that I felt compelled to turn up (especially the mumbling M) followed by an explosion that knocked me out my chair. Some of the Dolby Digital 5.1 effects were outstanding! The centrifuge was very realistic as Bond went round and round and the sound went across the surround speakers. Explosions were nicely rendered as they started in the center speaker, expanded out to the left and right and then climaxed with surround accentuation. The Brazilian Carnivale sequence took place pretty much in the front speakers and the space sequence would have seemed to be a perfect place for some channel manipulation but, it seemed flat. Overall the sound is a great part of this DVD package. Despite its flaws, it delivers the theater experience. The Moonraker Gallery (stills with captions)—good pictures and interesting captions. Extras Review: The extras included on the Moonraker Special 007 Edition are quite satisfying both for the casual viewer and the Bond aficionado. Both of the documentaries are absorbing and far superior to The James Bond Story released in 1999. The Men Behind the Mayhem covers the entire Bond series and crew members as they recount some of the techniques involved in creating the settings, the stunts and the gadgets of James Bond. It is quite funny when their eyes light up as they tell about some explosion or other that they created. Inside Moonraker focuses on this movie and provides some interesting interviews and insights about the special difficulties of making Moonraker look the way it did, both on Earth and in space. I enjoyed some of the audio commentary by Lewis Gilbert and members of the crew. Sometimes, I think of audio commentary as something to do as a last entertainment resort when there is really nothing left to do. But, this commentary is scene specific and Gilbert is an important figure in the development of the James Bond series. Even the booklet that comes inside the case is very good, full of interesting factoids. The original trailer is presented in anamorphic widescreen with mono sound and is an interesting artifact. The stills gallery is another "for a rainy day" feature, but I have to admit there were some interesting tidbits to be found in the notes to the pictures. Moonraker Special 007 Edition is a pretty good movie and a great use of the DVD medium. Heartily recommended as a good addition to any DVD library.